Posted on March 15, 2018 March 15, 2018 , in Hot Tubs. Utilizing extra space around your house to build a deck can open up a whole new vista on your property. However, such an addition requires careful planning and consideration. You’ll need to decide on the deck’s size, location and the materials you’re using to build it. That said, once built, a deck will provide more space for activities or relaxation while increasing the visual appeal of your house. A new deck also provides the opportunity to install a hot tub. In this article we’ll go over the major points to take into consideration when building a deck and planning for a hot tub. Understanding how you’ll be using your deck will play a major role in the building considerations. If you’re planning on using the deck as an extension of your kitchen and dining area you may have different design needs compared to creating an area that can house a hot tub or other facilities. If you’re hoping to create an area built for personal relaxation and gardening, you’ll have different limitations than if you’re going to use the space to entertain guests. The size and location of your deck will depend on the size of the area you have to work with. Other factors that come into play are the location of your neighbors, the course of the sun during the day, the weather patterns affecting your area and how close you want the deck to be to your house. You may also want to take into account the different viewpoints that your deck might offer. The type of hot tub you add to your deck will depend on all the aforementioned considerations as well as how you plan to use the hot tub in the first place. You may be satisfied with a small tub with seating for you and your loved one or your might want something much larger to accommodate your friends and extended family. Take into consideration that a hot tub typically ends up being a focal point of a deck area and plan accordingly. Knowing you’ll need to allow room for socialization will bring in a whole other list of considerations. Providing areas for seating arrangements, cooking facilities, such as a barbecue, and an easy pathway to some sort of dressing room will dictate how your new deck should be laid out. If you’re not personally skilled in construction or landscape design, you may want to look at bringing in professionals to ensure the job is done efficiently and properly. Speaking to landscaping and construction experts can give you a better idea of the issues you might face when trying to build the deck of your dreams. If you do intend to use landscaping or construction professionals, it’s in your best interest to get them communicating with a dedicated hot tub specialist early in the process. By having all the concerned parties brought together, you’ll end up with a collaboration that will be better than the sum of their parts and the deck of your dreams! 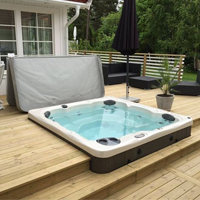 If you’re considering installing a hot tub as part of your new deck, download the hot tub buyers guide to learn more about the many outdoor models we carry.